Most parents, when asked what stands out to them most about their time at The Children’s TherAplay Foundation, will point to a specific gain. Like being able to sit up or walk for the first time, or tie their shoelaces. But for Kaleigh, whose son Ollie, receives both physical and occupational therapies at Children’s TherAplay, it is something completely different. It is the way Ollie’s whole world has opened up. Like many of children who receive treatment at Children’s TherAplay, Ollie is living with extensive medical and physical challenges. 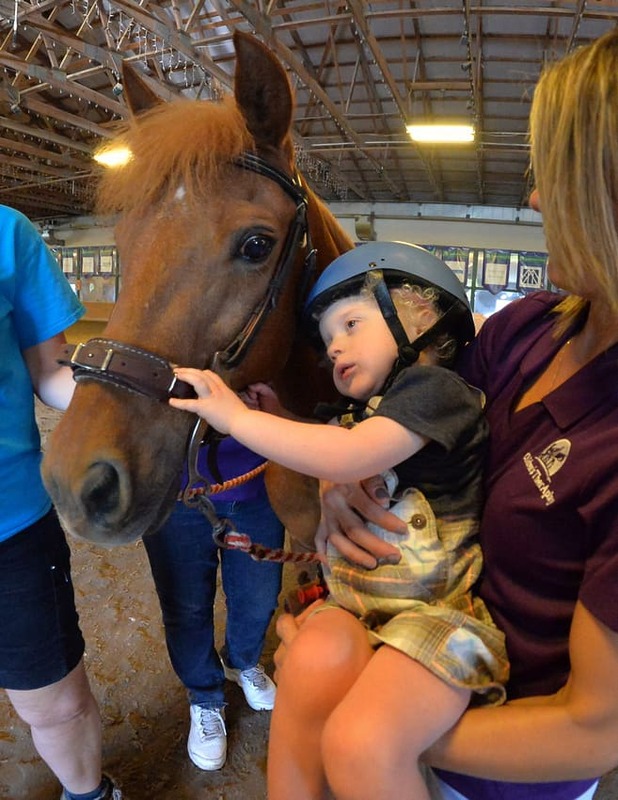 In his case they spring from a rare and complex genetic disorder, CHARGE syndrome, which results in loss of hearing, sight, and smell; heart defects; low muscle tone; feeding and swallowing difficulties; and a marked lack of growth and development. His parents tried traditional physical and occupational therapies first. Kaleigh notes, “We were making progress in early intervention, but it was very slow. … Ollie had hardly any neck or head control, no trunk, no desire for touching or any sensory input.” Which sent his parents searching for something more effective. There was more. Within six months of treatment “He started moving forward in leaps and bounds,” Kaleigh shares. “The walls that he had built were starting to crumble. 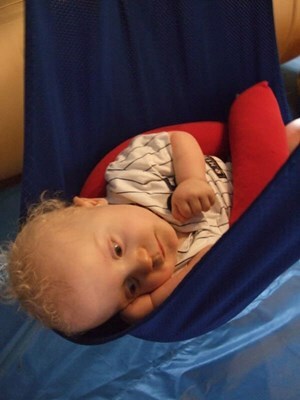 We saw this happy playful child who we knew was there we just didn’t know how to connect with him because the world had been so scary to him.” Ollie was progressing, and there was so much more to come. 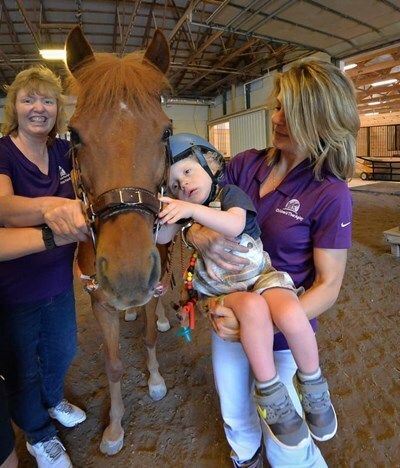 Four years later, through skilled physical therapy in the clinic and on horseback, Ollie has learned to sit, crawl, stand, and even transition into and out of each position by himself. Now he is learning to walk. It’s been more of the same – reaching goal after goal – in occupational therapy. Initially, Ollie would not explore something unless it was brought to him. And, even then, he was only interested in it for a few seconds. All this was possible because of hippotherapy. The rhythmic, dynamic, repetitive movement of the horse, and the way Ollie’s therapists calibrate it especially for him, provides something that no other treatment or piece of equipment can. Kaleigh says it so well. “We can do all the therapies in the world, but nobody can mimic what a horse can do, especially when it comes to their movement and stride and gait. There’s literally nothing out there like it. And then, this child who didn’t want to be touched by anyone, “wraps his arms tightly around her neck and squeezes. It just melts me.” This child is ready to get to work. He has a lot of living to do. How does hippotherapy help children with special needs? From the bottom of my heart, thank you for providing the opportunity for our kids to move mountains and giving them a fighting chance.